SAN DIEGO, June 30 /PRNewswire/ Anametrix, a leader in cloud-based business analytics technology, and The San Diego Union-Tribune, San Diego County‘s leading local media company, announced that The San Diego Union-Tribune has selected the InstaVista™ platform for both web analytics as well as real-time strategic insights across more than a dozen data sources, both online and offline. InstaVista™ is the ideal solution for multi-platform publishing companies, especially those with online newspapers, magazines and directories. The San Diego Union-Tribune can deepen its customer relationships, both online and offline, by anticipating future interactions and buying decisions to deliver appropriate content to each individual visitor. The San Diego Union-Tribune will also be able to offer its advertising partners self-service analytical dashboards through a cloud-based delivery model to create smarter, more effective campaigns. The screen-shot below shows a custom web analysis integration I developed (together with Alfred Lin) for the online shoe retailer Zappos. 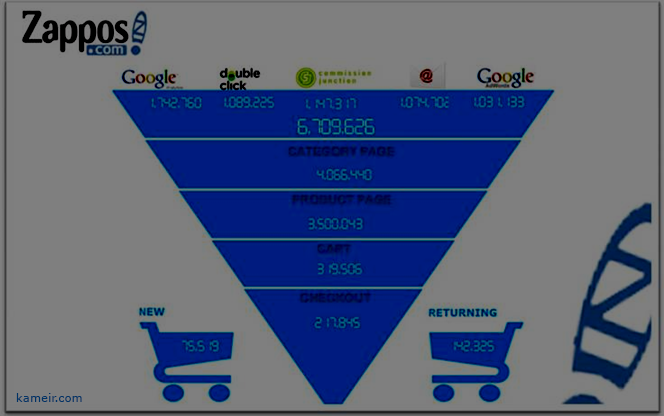 The objective for this dashboard is to provide a funnel overview for the marketing channels Pay-Per-Click, Affiliate, Email and SEO to visualize conversion rates within the eCommerce site (from homepage down to checkout) for the better allocation of marketing budgets (which in this case exceed to cost of personal). Data Sources: Google Analytics, DoubleClick, Comission Junction (batch), Custom DBs, incl. Email. Interface: Adobe Flex.